We guarantee all our products to be brand new (not factory seconds) and fully as described, 100% genuine products. 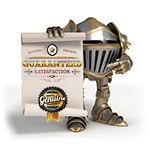 If your shopping experience is substandard in any way, please email us at: sales@sword-buyers-guide.com and either myself or one of my staff will get back to you as soon as possible with a comprehensive solution. BOTTOM LINE: Rest assured that no matter what your issue may be we will do our very best to work with you to ensure you leave with a satisfactory outcome (we PRIDE ourselves on customer service, after all - with the sites reputation on the line, we have a lot to lose if we don't look after a customer properly!). Should a product be out of stock (and we do our best to ensure this is rare and keep our site up to date, but despite our best efforts it does happen from time to time), we'll notify you of the delay immediately. If that happens (as I said, not likely), we will ask if you prefer to cancel your order for a full refund, change it to something else (of similar value, we will refund the difference) or, subject to availability, place it on backorder (its up to you of course). We proudly stand behind every product we sell. If you are not absolutely pleased with your purchase you can return it to us within 30 days of purchase in the original packaging and original condition via insured parcel post or UPS and we will give you your choice of an exchange or refund (excluding shipping fees). 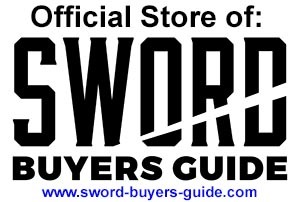 You must contact us via sales@sword-buyers-guide.com prior to returning any item so that a Return Authorization Number can be issued. Returned products must be in like-new condition with original packaging and materials. Unless the item is found to be defective or DOA, a 10% re-stocking fee may be applied towards your refund (if the item has been used heavily and is returned to us in poor condition from neglect or abuse, we reserve the right to return the item to you and no refund will be applied). Please allow a maximum of up to 14 days for processing of returns (usually much quicker). PLEASE NOTE: As to be expected, we cannot process refunds or cancellations made on our custom made and made to order items such as Forge Direct, Ryujin and the SBG Custom Katana. However if for some reason you are not happy with the final product or process we will work with you to ensure a satisfactory outcome. We guarantee if you keep it well oiled and maintained, the blade of any sword sold from the SBG sword store will hold up to a LIFETIME of reasonable usage without breakage. If it breaks during the course of reasonable and intended usage we will replace it with either the same (or if unavailable, a similar) model completely free of charge.